When you need a sprinkler zone changer repair or a sprinkler zone changer replacement anywhere in or around Fort Lauderdale or throughout Broward County, you can count on Above All Sprinklers! We recommend and use the best zone changer for your money, made by K-Rain. K-Rain is one of the world’s foremost manufacturers of Gear Driven Rotors, Sprinklers, Sprays, Controllers and Valves for the commercial and residential irrigation markets. With more than 100 patents and over 40 years of industry experience, our advanced design and engineering have made K-Rain products the easiest to install, set, and use. K-Rain has been exceeding expectations in the harshest proving ground, the field, for over 40 years. The natural setting of the real world is the perfect testing facility for our industry leading irrigation products. They didn’t read the book on turf irrigation, they wrote it. We offer a variety of different K-Rain products and will always be able to find the right model for your needs. If you need a sprinkler zone changer repair or a sprinkler zone changer replacement, call us at (954) 588-9988 or use our simple FREE ESTIMATE form. We're here and we're ready to help you. Call us at 954-588.9988 or click below to get your FREE estimate today! The 4000 line of indexing valves offers a reliable, economical way to automate multiple zoned residential and small commercial irrigation systems. These patented indexing valves allow for the number of watering zones to be changed quickly and easily. They are ideally suited for both city water and pump applications and may also be used for onsite wastewater or effluent water applications. The simplicity of design and few moving parts ensures ease of maintenance and long service life. 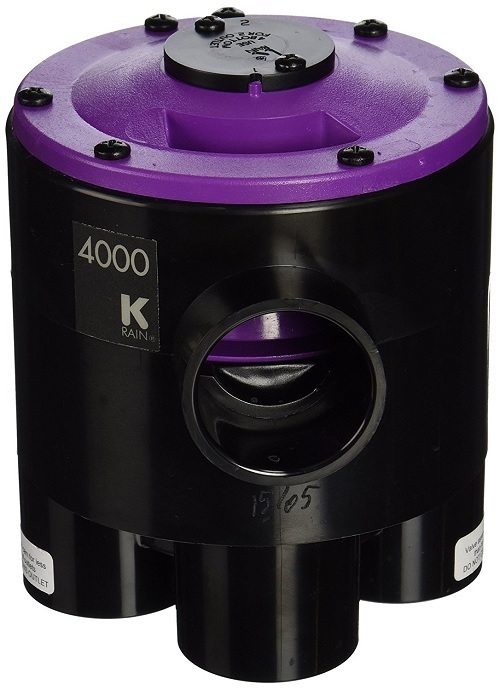 The 4000 valve is available in 4 or 6 outlet models. A quick change of the cam allows the valve to operate with flows as low as 10 GPM and at pressures of 25 to 75 PSI.